If you place your fingers right underneath each ear and open your mouth, those little hinges you feel are actually your TMJ, or temporomandibular joint. This joint, like others in the body, can sometimes become misaligned and dysfunctional, which can cause pain throughout the jaw, head, face, and neck. Rather than just treating the symptoms, the team at Bethel Dental can get to the root of TMJ pain and treat it directly to provide long-lasting relief. If a patient reports or exhibits any of the classic signs of TMD, our team will try to find the source of the problem by taking X-rays of the joint and testing the mobility of the jaw. Based on what we find, we can then recommend the appropriate treatment. This may be as simple as recommending that a patient do a few gentle stretches every day, or we may have to adjust the bite to help reorient the joint (more on this below). 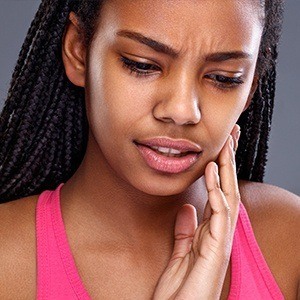 In many cases, TMD is caused by a misaligned bite that is putting extra pressure and stress on the joint that it is not meant to handle. To correct this, the teeth must be reshaped so that they come together properly and distribute the chewing forces evenly. This will enable the jaw and the surrounding muscles and ligaments to function in a more balanced way, helping ease any tension and pain. This can be accomplished using multiple methods. 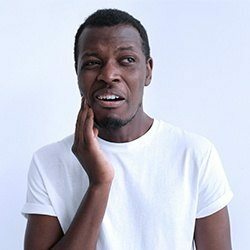 We can place dental crowns on specific teeth to make them wider or taller, or we might actually shave down a few teeth to even out the bite. In some cases, a combination of the two is needed. Before beginning treatment, we’ll take an impression of the teeth to find out how the bite pressure is distributed so we can be as conservative as possible while achieving long-term results.